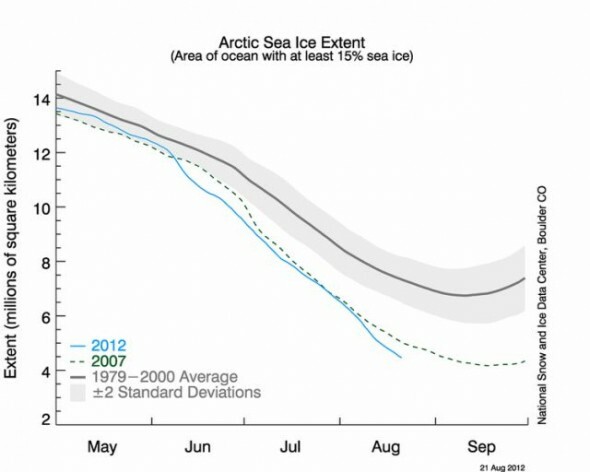 Arctic sea ice extent. Area of ocean with at least 15 percent sea ice as of Aug. 21, 2012. Credit: National Snow and Ice Data Center. UXBRIDGE, Canada, Sep 20 2012 (IPS) - The melt of Arctic sea ice has reached its lowest point this year, shrinking 18 percent from last year’s near-record low. The region has been prone to bad winters after summers with very low sea ice, such as 2011 and 2007, Francis said. “Arctic sea ice plays a critical role in regulating the planet’s climate. As man-made global warming shrinks the ice, our risk of droughts and other extreme weather goes up. We can’t wait any longer to cut carbon pollution,” Wolf said in a statement. A Canadian study published last week estimated humanity’s climate heat emissions will thaw enough permafrost to release 70 to 500 billion tonnes of carbon by 2100. The amount of additional heating from these permafrost emissions is estimated to be 0.4C to 0.8C. That’s in addition to the estimated three to four C expected with estimated fossil fuel emissions to 2100 based on current commitment pledges. It is the first-ever modelling study of this, however, it does not include heating from the massive methane emissions that are also expected. Nor does the study incorporate a model that accounts for the rapid melt of sea ice in recent years, said Andrew MacDougall, a University of Victoria, British Columbia researcher. “In that respect our study underestimates the amount of potential warming,” MacDougall told IPS. A global average temperature rise of two degrees C means four to six C in the Arctic, enough to melt much of the permafrost. Preventing this requires putting a high price on the carbon, says activist and writer Bill McKibben. Oil giant Exxon and the rest of the industry derive much of their enormous profits by using the atmosphere as a garbage dump for the climate-damaging carbon they dig out of the ground, he said. One way to price carbon is through a “fee-and-dividend” scheme would put a hefty tax on coal and gas and oil, then simply divide up the proceeds to people based on their income to help offset the increased costs. “By switching to cleaner energy sources, most people would actually come out ahead,” writes McKibben. Carbon pricing has to happen in the U.S. and that means breaking the fossil fuel industry’s hold on Washington’s politicians, he said. Good thing that-there global warming is just a Librul myth, ainnit?